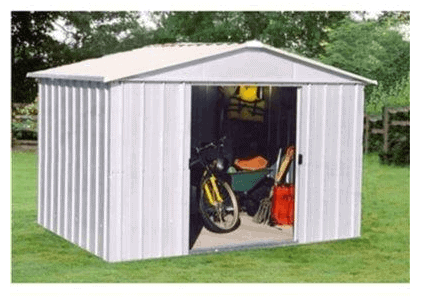 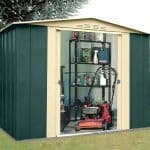 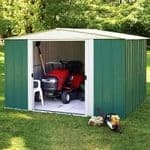 A great affordable metal shed which won’t break the bank! 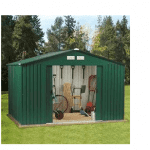 This model comes with large double doors allowing the user plenty of easy access to stored gardening equipment. 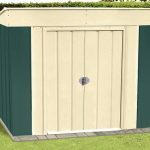 There is ample space inside for your gardening equipment, garden furniture and outdoor toys making this an excellent weatherproof storage solution with a 10 year guarantee. 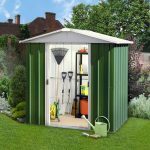 Handsome in looks, it is designed to emulate traditional wooden sheds but as it is crafted from hot dipped galvanised steel and coated with polymer, it is maintenance free. 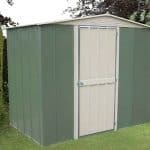 So when purchasing this shed you have made a wise choice as not only does it look good but it will last you for many years.